The energy sector hasn't seen many outright victories over the last number of years under the Trudeau government — but it got a $40-billion shot in the arm Tuesday after LNG Canada made a positive final investment decision. The energy sector hasn't seen many outright victories over the last number of years under the Trudeau government. Prime Minister Justin Trudeau's cabinet approved the Pacific NorthWest LNG project, only to see the proponent cancel its $36 billion investment. TransCanada pulled out of the Energy East pipeline project over regulatory pressure and the Trans Mountain expansion is mired in new legal troubles. But on Tuesday, Canada's energy sector marked a win. So did the prime minister. The proponents of LNG Canada made a positive final investment decision: a stunning commitment of $40 billion that ultimately will be the largest private sector investment in the country's history. Trudeau couldn't contain his glee over that fact during the news conference announcing the investment. He repeated it three times over the course of his speech — smiling a little wider each time he said it. The project will liquify and transport natural gas from the low-cost Montney gas fields that straddle the Alberta-B.C. border to energy-starved markets in Asia, many of which are heavily dependent on coal to keep the lights on. A terminal for the project will be built near Kitimat, B.C., on the traditional territory of the Haisla Nation — First Nations peoples who have endorsed the project and the resulting social and financial benefits that are expected to flow to them. Construction will start right away; all the necessary federal and provincial approvals are in place for both the terminal and the pipeline that will feed it. Tariff relief for some necessary steel components has been granted. And the power supply agreements — B.C. Hydro will supply some clean power to the project — are up and running. "Today, a few dreams are realized," Andy Calitz, the CEO of LNG Canada, said as he announced the company's decision. "The first one is it validates the reality that, in B.C., projects can be done if they're done in the right way when it comes to resource development through a process of building relationships before we build the project." 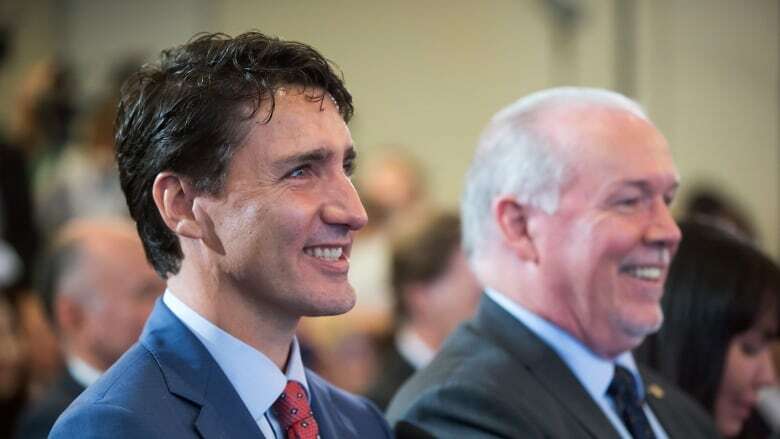 "The second one is we've taken the first [investment in a] British Columbian energy project to show the prime minister that it can be done in Premier Horgan's province," he said, to laughter from the crowd. "That comment was made to unite, not divide." The last remark was a thinly veiled reference to B.C. Premier John Horgan's continued opposition to the Trans Mountain expansion project — his government has sought to stop it in the courts — but also to the perceived errors of Kinder Morgan, the original proponent of that crude oil pipeline, and to its ill-fated attempts to secure support from coastal B.C. First Nations around the Burnaby terminal. At a glance, the Trans Mountain and LNG Canada projects look rather similar — two massive energy sector construction operations in coastal British Columbia carrying a lot of political weight. But the similarities fade when you take a closer look. Horgan — who opposed LNG development when in opposition — praised the project Tuesday as a game-changer for the province's north, a source of wealth for a region that needs it. "This is a spectacular day for B.C. I can't stop smiling," he said. Haisla Nation Chief Councillor Crystal Smith's eyes brimmed with tears as she watched the project's announcement. She thanked Shell and the other backers for agreeing to build the terminal and the supporting infrastructure near her community. "I applaud your leadership," she told Calitz. And while the Federal Court of Appeal struck down cabinet approvals for Trans Mountain — because it found the constitutionally mandated consultation efforts with Indigenous peoples were inadequate — an entirely different set of B.C. coastal First Nations are praising LNG's outreach efforts. "You've guided your team and blazed a path for how project development and First Nations communities can come together to create hope and opportunities for generations. We extend our deep gratitude for the investment being made in Haisla Territory." Twenty-four other First Nations, and their elected band councils, have signed financial agreements related to the project, which will lead to millions of dollars in community support payments, work for First Nations-owned construction businesses, education and jobs. While mayors in Vancouver and Burnaby supported the Federal Court of Appeal case against the Trans Mountain project, Kitimat's mayor, Phil Germuth, was effusive in his praise for LNG. "They've really shown and set a standard for what it takes to go out and get a project done these days," Germuth said of LNG Canada. "They truly deserve a round of applause for the amount of amazing work that they've done," he said. This is exactly how the federal Liberals had hoped to see their energy agenda unfold: oil and gas boosters complying with environmental regulations, securing buy-in from local communities, consulting with First Nations and, in turn, getting government approvals and a green-light to build from regulators. 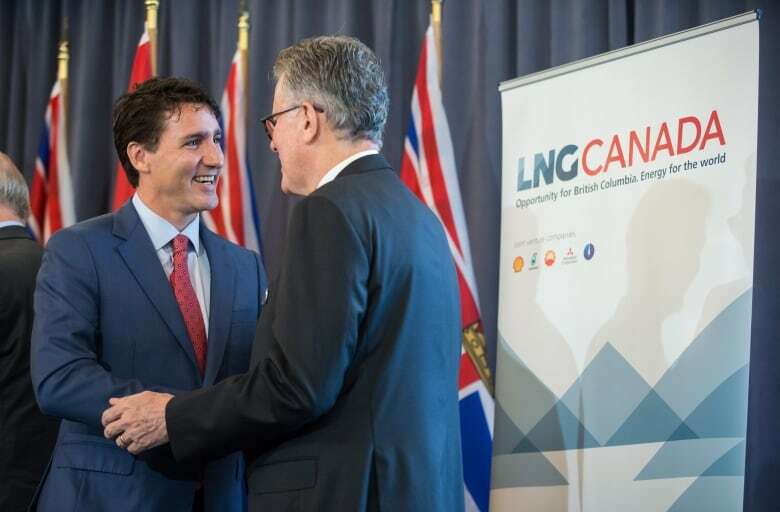 While the success of the Liberals' energy agenda has been fairly limited so far, with LNG Canada Trudeau can claim a victory — even if most of the project's approvals were completed under former prime minister Stephen Harper and his Conservative government. Still, Trudeau did meet three times with senior leaders of Royal Dutch Shell in Davos, Switzerland, in China and, just last month, in New York at the UN — lobbying the multinational consortium of oil and gas companies to commit to an investment. And the fate of that investment was far from certain after a final investment decision was put off in 2016. "Shell and its partners didn't make this $40 billion investment in Canada as a last resort. It was a choice. It was a vote of confidence in a country that recognizes the need to develop our energy that truly takes the environment in to account and works with Indigenous communities," Trudeau said.